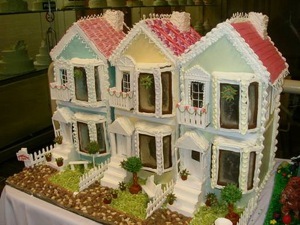 Check out these fantastic Gingerbread townhomes! Imagination is really everything when it comes to creating homes from Gingerbread. These Victorian Gingerbread townhomes are decorated with huge windows that you know let in plenty of light, lacies around the roof lines, ornate little balconies, chimneys, stairs with flower pots, gardens and benches, and sweet landscaping. Visit here for details.